Rates vary depending on the package that you choose and also on the season. There are usually no guides available for these tours unless you use a Tour Operator and ask for one. The local taxi drivers offer these tours and drop you to the sightseeing points. They will wait outside while you take your time to enjoy the tourist places. But note that you must complete all the points within the overall stipulated time, otherwise the drivers could ask for more money. Darjeeling Tourism Card offers great discounts with several top tour operators in Darjeeling who offer local tours in both Darjeeling & Sikkim. It also fetches you great discounts at many hotels, restaurants, bars and shops as well as on airport/station pick ups and drops. Tiger Hill: Who doesn't know about the magnificent view of sunrise from Tiger Hill. You will need to wake up by 3:30am and take a vehicle. But the rewards are awesome. You can see the changing colors of the Kanchenjunga snow peaks as the light strikes. On a clear day you can also get a glimpse of Mount Everest, Mount Makalu and one of the most beautiful peaks of the world, Tibet's Chomol Hari. Tiger Hill is 11kms away and at an altitude of more than 8,400ft. It takes about 40 minutes to reach the top where there is a view tower for watching sunrise. There is an entry fee. Ghoom Monastery: On the way back from Tiger Hill, you will visit one of the oldest Buddhist monasteries of Darjeeling located at a scenic location in Ghoom area. It houses a 12-foot tall statue of Mayetriya Buddha which represents the Buddha of the future. No entry fee but donation required for taking photos inside. Batasia Loop and the War Memorial: Batasia Loop is an engineering marvel located in Ghoom area. This is where the toy train makes a double spiral loop to negotiate a drop of 1000 ft as it moves towards Darjeeling town. Amidst the beautiful garden where the railway track is laid in form of a loop, there is also a War Memorial. It was constructed in honor of the Gorkha soldiers who sacrificed their lives in service of the nation. There is a nominal entry fee. Don't miss the Samosas (fried vegetable pastries) that are sold near the entrance of Batasia Loop in the morning. There are five points or sightseeing attractions covered in about three hours. All the sites are within short driving distance. If you are taking a shared vehicle or a taxi, you can choose to go either in the first half or in the second half. Japanese Temple & Peace Pagoda: Close to the Darjeeling town and in a scenic setting there is a temple built in a traditional Japanese style. About 100 yards away and in the same complex, there is large Peace Pagoda that showcases four avatars of Buddha. The view of the mountain range and Darjeeling town from the top of the pagoda is spectacular. No entry fee. Caution: In order to save time, some drivers try to treat these two attractions as separate ones and count 2 instead of one. Don't be deceived or you will miss out on one of the following. Lalkuthi or Lal Kothi: This is a plush bungalow style building locate close to the Japanese Temple and has a beautiful garden, manmade waterfalls, ponds and having an amazing view of Kanchenjunga. It was once the site of several films including the Bengali movie Lal Kuthi. It was later converted into the erstwhile Darjeeling Gorkhaland Hill Council Secretariat. It has now become the main office of GTA (Gorkha Territorial Administration)... a governing body that runs the administration of Darjeeling district. Since entry inside is no longer allowed, you can only see it from outside... you can give it a miss if you want. Dhirdham Temple: This is a Hindu temple of Lord Shiva located close to the Darjeeling Toy Train Railway station. It's a close lookalike of the Pashupatinath temple of Katmandu, Nepal. There is no entry fee. Donations accepted. Ava Art Gallery: This art gallery has exquisite artwork of late Ava Devi who was a specialist in embroidery art. It's located on Hill Cart Road and about 4km from the town center. No entry fee. Bengal Natural History Museum: A museum rich with the fauna of Bengal and particularly of the Himalayan region. It has many preserved specimens of birds, reptiles and fishes, mammals, insects and more. There is an entry fee. Update: In 2018 the museum has moved to the compound where Himalayan Mountaineering Institute and Darjeeling Zoo are located. So it is no longer part of 5-point tour. The taxi driver would suggest an alternative attraction close to Darjeeling town such as Himalayan Tibet Museum on Gandhi road. Here are the most common points covered under this tour. Sometimes variations are made. These are three attractions co-located in the same large compound. The Himalayan Mountaineering Institute was built to honor Tenzing Norgay's triumph to the Everest and is dedicated to provide mountaineering and rock climbing lessons to students from all over the world. There is a mountaineering museum as well. The highlights of this museum include the artifacts from various Himalayan expeditions, the Everest section showcasing Tenzing's personal belongings, an eagle found dead at 26,000 feet during 1960 Everest expedition, a high power telescope that once belonged to Hitler and was used by the Institute etc. Darjeeling Zoo has many high altitude Himalayan animals including Snow Leopard, Tibetan Wolf, Himalayan Black Bear, Red Panda, yaks etc. And the Bengal Natural History Museum is great to know about flora and fauna of Bengal including high altitude animals of Himalayan region as well as of Darjeeling district. There is a combined entry ticket to visit all three attractions in one go. Darjeeling Ropeway: You will board the cable car from Singamari located 3km away from the town center. The 45 minutes ride takes you from an altitude of 7,000ft to 800ft with wonderful vista of a valley around Rangeet river, tea estates and sweeping views of the snow peaks of Himalayan range including Kanchenjunga. Ticket needs to be purchased. During high season, there may be long queues. So try to book in advance. Tenzing & Gombu Rock: These huge rocks are located on Lebong Cart Road where rock climbing is practiced. At the Tenzing Rock, Tenzing Norgay used to practice rock climbing. Look at it from the left side where you can see the bottom of this gigantic rock. During a visit of former Prime Minister Late Jawaharlal Nehru, Tenzing demonstrated a climb on this rock without any safety equipment. No entry fee. Happy Valley Tea Estate: An old tea estate that exports all its produce to Harrods in London and few other countries. You can see the delicate tea processing in the factory with the help of a guide and buy tea packets from its outlet. You won't get this tea anywhere else in the country. There is no entry fee, however there is fee for the guide. Tibetan Refugee Self Help Center: A center and a factory established by the Tibetan refugees who fled Tibet and took refuge in Darjeeling. They not only live here, but also produce varieties of exquisite handicraft items to make their livings. The hand crafted items include jackets, carpets, gloves, aprons, bags, curios, cards, pouches, carved wooden items, Tibetan paintings etc. This is a great place to buy a gift or a souvenir for your friends and relatives. There is no entry fee. Lebong Race Course: 8km away from Darjeeling Town Center, this was the smallest race course in the world (a full lap is 480 yards) and the one located at the highest altitude (5935 ft). It was created in the 1800s during the British colonial days when horse betting was very popular. However, it is no longer used as a race course and has been converted into a parade ground. You can see the ground from Darjeeling Mall road. 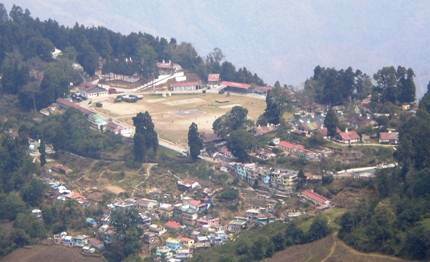 Gorkha Football Stadium: This is an alternative to the race course. The stadium is also located in Lebong. Youngsters play soccer here. The ground is also used for many soccer tournaments as well for festivals. The ground looks wonderful with Kanchenjunga and the other snow peaks forming the backdrop. Rock Garden, also known as Barbotey Rock Garden is a lovely picnic area located some 10kms from Darjeeling Town. The road is steep and winding and descends by several thousand feet. However the garden with natural water streams flowing through it over the rocks and seating areas with flower gardens at different levels, is great place to picnic and spend few hours. A short distance from here and further down is the Gangamaya park which too has water streams, parks and fountains. There is a cultural dance program held here during the high season. Many locals walk down to these places. I won't recommend that for visiting tourists who are not used to hill walking. Check out Rock Garden & Ganga Maya Park for details with pictures. If you are one of those who doesn't exactly like any of the above set tours, then there is one more option - Mixed point tour which tries to maximize between all the other options. Rock Garden & Ganga Maya Park can also be combined at an additional charge. Tour timings would change accordingly. You will find plenty of private taxis at the stands offering local sightseeing tours. Once you approach one, many others will also swoop in. Depending on the demand, they will offer varying rates and eventually you will get dragged into haggling and bargaining. And often their cars are not in good conditions. Most taxi drivers have no background knowledge about the tourist places and are poor guides themselves. Taxis are available at the Club Side taxi stand (Gandhi Road or Laden-La road) next to the traffic police point. There are also lots of taxis at the Chowk Bazaar motor stand at the lower level. Talk to few drivers before you finalize. Also keep in mind that most taxi drivers are inflexible and tend to rush you through the points. A better option is to go through one of the Well known Tour Operators who may charge you a bit more than usual taxi rate, but will provide a good private car and a knowledgeable friendly driver. A good driver in my view is vital for such tours. They will not only tell you stories along the way, but also keep track of the time. Almost all hotels offer these tours as well. The smaller hotels often engage a local tour operator and take a commission at your cost. The luxury hotels will have their own vehicles but will obviously charge a hefty premium. However for cheapest possible option in local tours, you can get shared jeeps at Clubside (Gandhi Road) taxi stand who often offer such tours on a per person rate. While 3-point tour on shared jeep is usually available in season, other sightseeing tours are available only when there are enough tourists seeking such tours and their timings match. Although the shared jeeps usually stuff in more people than what may be comfortable, the rate turns out to be very attractive. There is a kiosk run by the taxi drivers' association and known as Upper Clubside Vehicle Owners' Association which is located next to the Clubside stand on Gandhi Road. You can book tours on taxi or shared jeep through them. Another option: The GTA (formerly DGHC) Tourist Information Center located on the Mall Road (Bhanu Sarani) and the Tourist Bureau located on the Mall & run by the West Bengal Tourism offer the above tours on a per person rate during the high tourist season. The rates are very reasonable. You can walk down to their offices and book the tours. Update April 2014: GTA Tourism is no longer conducting tours. The rates vary depending on demand (i.e. high or low tourist season), the type of tour you choose and also on the changing fuel prices. Rate for larger vehicles (like Scorpio, Bolero, Sumo etc.) are higher than smaller cars like Santro, Wagon-R, Maruti Van etc. 3-Point tour is also available on per person rates in shared jeeps that leave from the Clubside stand next to Gandhi Road traffic police point. They take about 10 persons per Jeep. This is suitable for those who are looking for low budget tours. 1) The tour charges do not cover any admission fees or cost of food. 2) The rates from the Tour Operators would be higher than taxi rates, but you can expect a vehicle in good condition and a driver more professional and friendly in nature. 3) Larger taxis below means vehicles like Tata Sumo and not Luxury Vehicles like Innova or Scorpio. (1) 3-point tour covering Tiger Hill, Ghoom Monastery and Batasia Loop: Costs Rs. 1200 by small private taxi, Rs. 1500 by Sumo, Rs. 150 per person in shared Jeep for up to 10 persons. (2) 7-Point tour (4 hours): Rs. 1500 in small taxi, Rs. 1700 in larger taxi. Shared Jeep Rs. 170 per person (if available, usually only in high seasons). (3) Mixed Point tour (7 hours): Costs Rs. 2500 in small taxi, Rs. 3000 in larger taxi. (4) 5-Point tour (3 hours): Costs Rs. 1200 in small taxi, Rs. 1400 in large taxi. (5) Rock Garden/Ganga Maya (half day trip) is Rs. 1600 in small taxi, Rs. 1800 in large taxi. 1) Check out Darjeeling Tours for many other great sightseeing and day tours from Darjeeling. It is possible to cover all the four in a day... you must time it correctly. It will also depend on the wait time at Ropeway ticketing queue. You should take a private taxi (there is anyway no shared taxi for Tiger Hill other than for sunrise). If you love nature, you can visit Tiger Hill even after sunrise. However Tiger Hill is mostly known for the sunrise view. Kanchenjunga can be seen equally well from other places like Mall road, Batasia loop etc. Sir is it necessary to take a package for sightseeing? We want to take a taxi there for a day tour. Can we get any bikes for rent. You can negotiate with a taxi driver, tell him the places you want to visit and arrive at a price. The moment you customize, you will end up paying lot more than usual. Motorbikes are available for long self driven tours (several days) and not for local sightseeing for few hours. Hi Raj, Firstly my best wishes on the effort you have poured to have such detailed information about Darjeeling. I am visiting in August end and have been reading your website for the past couple of days. I seek your clarification regarding the duration of the 7 point tour which is mentioned as a 3.5 hours tour. I have my doubts that its nearly impossible to cover all the 7 spots in such a short time since it includes HMI, Zoo, and the Ropeway and tea estate among others. That's all the time you get... may be another 30 minutes at the most after which the driver will charge you extra by the hour. In high season, it's quite likely that you may end up standing on the ropeway queue itself for couple of hours. You can't factor such time into these packages, particularly with taxi drivers. Tour Operators would be more flexible. However some points in the package are pass-by places... you will perhaps not spend more than 5 minutes on them. Those are indicative rates and will vary quite widely depending on time of travel. Your time is in peak season and rates will be quite high. It's advisable to go through a reliable operator like Ashmita Trek & Tours who can provide good quality cars. Book in advance. They have published rates on their website. They offer 15% discount to Darjeeling Tourism Card holders on many packaged tours. Sirji, I am reaching NJP on 22-09-2014 at 22.00hrs night. My hotels are booked at Gangtok(23 to 25), Pelling (25 to27) and Darjeeling (27-29). Since I am alone, can I get shared vehicle from NJP to Gangtok and sharing vehicle at Gangtok for site visits. Similarly from Gangtok to Pelling and site visits at Pelling and finally shared vehicle from Pelling to Darjeeling and site visits, and return from Darjeeling to NJP by a shared vehicle. I will be grateful for the information. Hi, for transfers between the places, you will get shared jeeps from the stands. But for local sightseeing you may not always get shared jeeps, it depends on other tourists wanting such sightseeing trips at the same time.